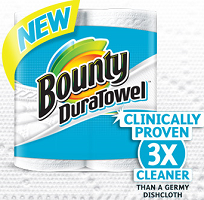 To get the $1 Off Bounty DuraTowel Mailed Coupon login or register. If you are NOT a member of Vocalpoint be sure to sign up here, they offer some of the BEST freebies throughout the year! Your packet should arrive in 5-7 weeks.